From now until St. Valentine’s Day, February 14, take advantage of “Paula’s Heart Special”. Buy any two rings and get a third ring of your choice for free !! Buy any two pair of earrings and get a third pair for free !! The free ring or earrings need to be of equal or lesser value than the lowest price item you purchase. For example, if you purchase a $100 ring and and $80 ring, you can have a ring of your choice worth $80 or less for free !! Here’s how to take advantage of this special offer. Browse rings in three places: our New Native American rings, our Native American Pawn Shop rings and our Bargain Barn Rings. Decide which 3 rings you want and place the two highest priced rings in the cart. Don’t add the ring you want for free to the cart. Instead, as you are checking out, in the note section of the order, enter “Paula’s Special” with the item number of the ring you want for free. By the way, if you are looking at a ring or earring lot, that will count as one item whether your are buying or claiming your free item. Only rings that have an order button on their page are eligible. If an item says SOLD, it is no longer available. Similarly, you can buy two pair of earrings and choose one pair for free. 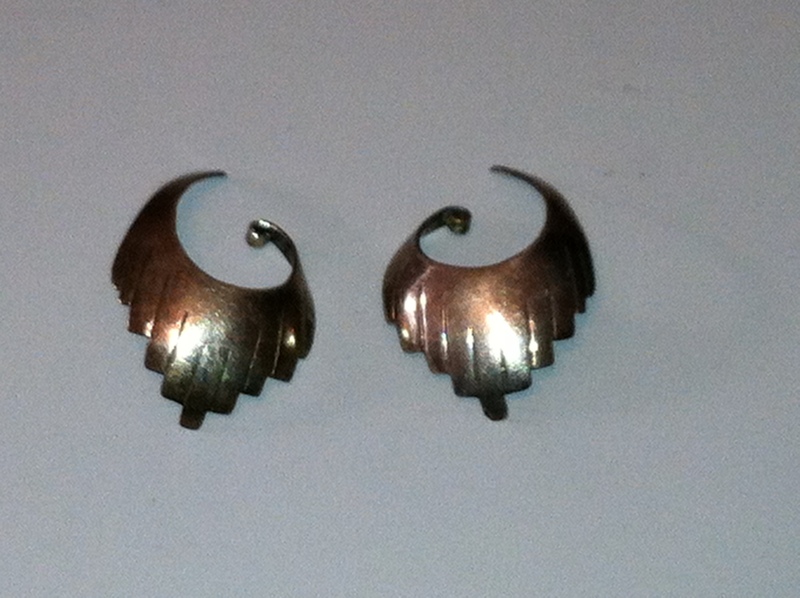 Single ear cuffs count as one pair whether you are purchasing or requesting for free. Here are the three earrings sections. Feel free to mix and match between rings and earrings. I think that’s about it. If you have any questions, be sure to ask ! I answer promptly. 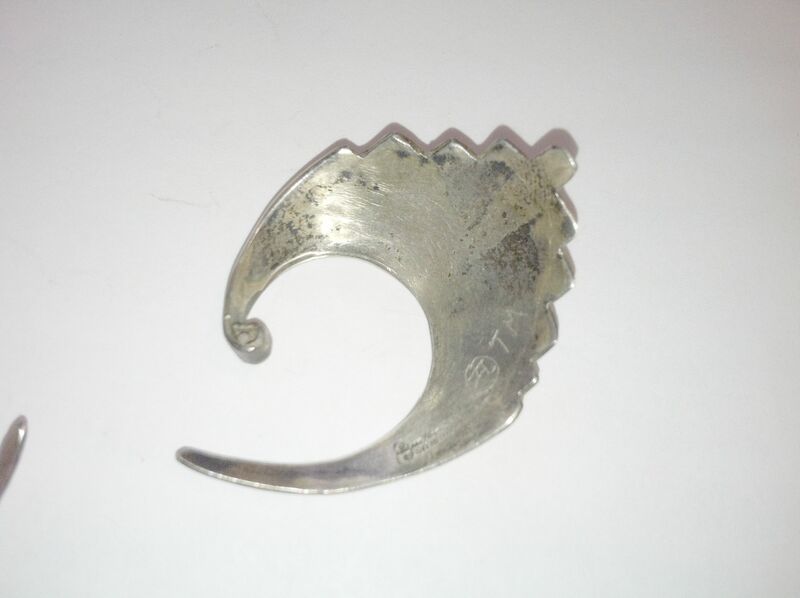 Ear Cuffs and other Stuff……..any ideas? I have a piece if jewelry that I am not even sure of what it is. I know they are to wear on the ears and I call them cuffs, but they are not exactly cuffs. The mark inside if very hard to read for me. I will attach photos and see if you can make it out. I can see Sterling and then 2 indiscernible words. The mark is TM and then hand etched a circle with another emblem in the circle. I slightly polished with a cloth trying to get a better view. The other pieces are just some things I have had for about 40 years. Nothing spectacular, but I would love if you could tell me anything about them. The silver band is the only one that is marked and it has a mark of LS and a stamp that looks almost like a face to me. The other pieces have no marks what so ever. Thank you for any info you can provide on the ear cuffs. I don’t wear earrings so I might be way off on this but my take is that these are either post or wire hoop-style earrings that have lost their posts or wires ! They look like earrings I have seen made in Mexico. Again, I could be all wet on this and I invite readers of this blog to chime in. I can’t really read the hallmarks even when I Iightened the photo. 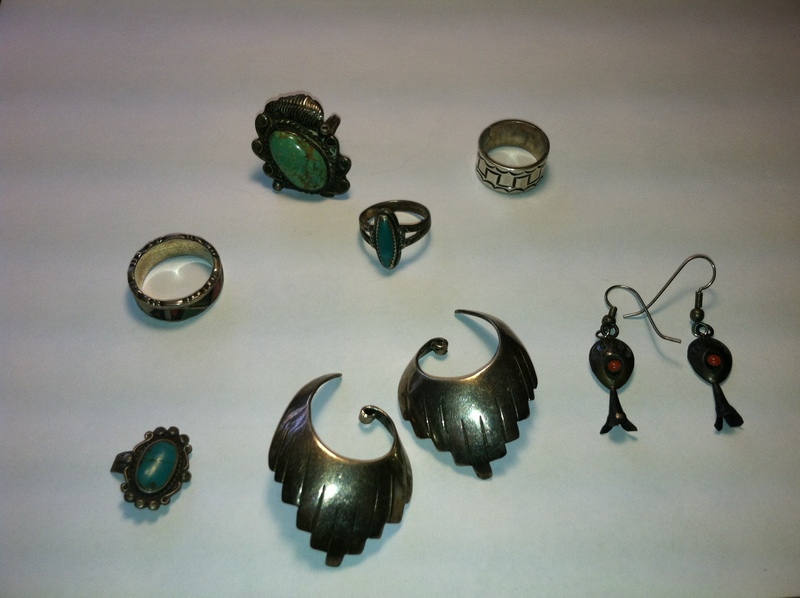 As far as your other items, the big turquoise ring, the ring next to the “ear cuffs” and the coral earrings seem to be in the style of Native American made items but it is hard to tell from the group photo. The coral earrings are squash blossom style since they have the 3 petal squash blossom embellishment at the bottom as you see on the necklaces such as this. Perhaps your earrings were part of a necklace set in the past. The little ring between the big turquoise ring and what you are calling “ear cuffs” could be a Bell Trading Co. ring. It looks the style. Read about Bell Trading Co. here. It is possible that your other items are Native American made or they could just be southwestern style jewelry. It is hard to tell from the photo. Clip earrings. They are a thing of the past ………. or are they? More and more we are seeing clip earrings in retro fashion photos. And with repurposing being all the rage……..many of these little beauties can have second, third and fourth lives !! Today I got playing around with all the clip earrings we got in an estate lot. Just with the one omega necklace that I wore to work today, I came up with some really cool combinations. Doubles flanking the Merle House inlay pendant I wore to work today. Wow ! Radical. First of all, in the case of these vintage, New Old Stock sterling silver earrings, many are hallmarked and made very well. Next, they are inexpensive. You get two “pendants” for a fraction of the cost of one. Because you get two, you can use two in mix and match creations. You can lose one and not cry because you will still have one pendant. You can keep one and give one to your best friend. You can wear one as a pendant and clip the other to your shirt collar, your jeans pocket or cuff.